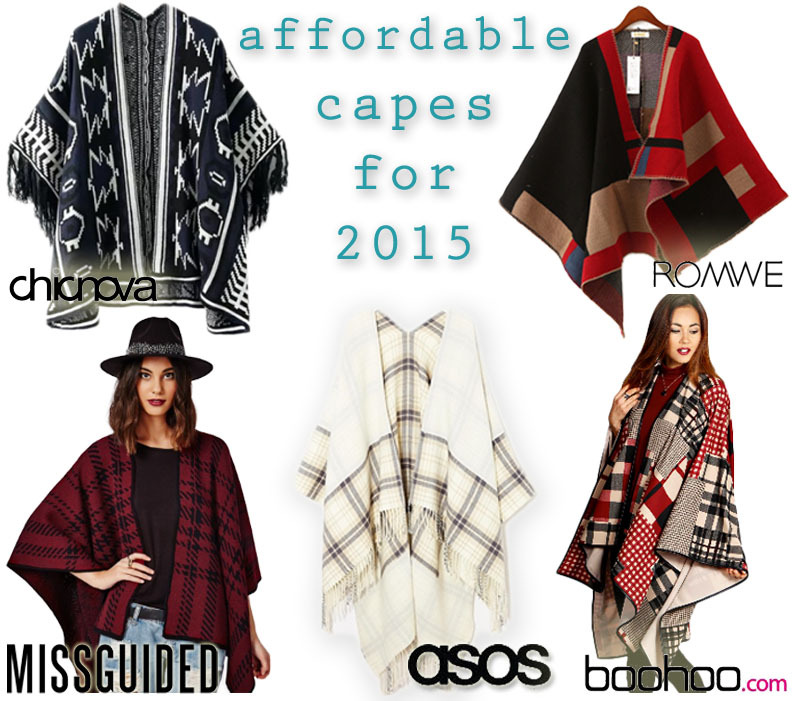 The Stylish Five: Affordable Capes Just In Time For 2015! If Santa didn’t fulfill all of your style picks on your holiday wishlist, you haven’t missed out on the best must-have outerwear of the season yet! Capes of all varieties have been everywhere, making that transition from fall to winter all the more stylish. However, the weather has been pretty fickle here on Long Island, which makes the necessity of a cape all the more important. The great news is that you don’t have to break the bank to add a cape to your wardrobe. Capes present a style opportunity to play with prints & textures, from color blocking to plaid to tribal to menswear inspiration. SHOP: check pattern cape ($26.00) @Boohoo, color block batwing cape ($36.67) @Romwe, reversible cape with check panel ($47.38) @ASOS, burgundy check blanket cape ($43.70) @Miss Guided, & vintage print tassels cape ($45.00) @Chic Nova. Have you been shopping around for a cape this season? Which cape suits your style? Which pattern is your favorite? For more stylish posts, check out my new favorite deals from LOFT & Payless, bargain scarves from Forever 21, the top 10 Style Darlings to watch for in 2015, as well as Pre-Fall 2015 Collection lookbooks from Tory Burch, Oscar de la Renta, & Marchesa. Happy Styling! This entry was posted in Accessories Access, Basics for a Bargain, Luxury Look-Alikes For Less, Quickie Darling Deal & Steal, Splurge or Save?, Style Darling Daily, The Stylish Five and tagged Accessories Access, affordable fashion, ASOS, Basics for a Bargain, boohoo, capes, ChicNova, fashion, Luxury Look-Alikes for Less, MissGuided, Quickie Darling Deal & Steal, Romwe, shopping, Splurge or Save?, style, Style Darling Daily, style for days, style tip, The Stylish Five. Bookmark the permalink. ← Runway Rundown: Alice + Olivia’s Pre-Fall 2015 Collection Lookbook!